If you're the type of person who recognizes what a great deal some of these properties could represent, you will be interested to know about our free Power of Sale members monthly Newsletter. Our foreclosures list is updated daily so you have access to homes and condos that were just put on market. Received privileged confidential links to one of the Most Comprehensive Listings of Power of Sales, Bank Foreclosures in Toronto and Surrounding areas of the GTA. 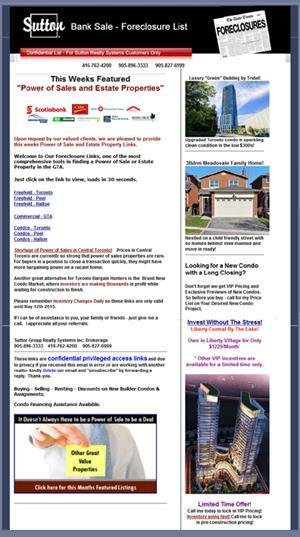 Due to the confidential nature of the information please call 416-896-3333 Ext 23 to be added to our monthly email newsletter. Or fill out our form below and provide a contact number. We value your privacy and you will not be bothered other than to confirm the intent and use of our content. Power of Sales in Toronto, broken down into Freehold and Condo Bank Foreclosures. It is helpful if you are aware of the Toronto Real Estate Board district maps. Our Toronto List of POS is sectioned into West, Central, North and East. Power of Sales in Mississauga are broken down into Freehold and Condo Bank Foreclosures which can be found in the West Section of our Links. Homes under Bank Foreclosures should not always be considered Fixer Uppers or distressed properties. You may be surprised to see the condition in many of the homes is exceptional and may just need cosmetic assistance. Fresh paint, landscaping and a really good clean can make a world of difference in many cases. Our #1 Tip for Purchasing a Power of Sale. Patience! Purchasing a Power of Sale requires offers to be submitted to the Bank or CMHC typically during business hours. Unlike an owner occupied property, dealing with a corporation can take more time. We will explain the process of submitting an Offer on a property under Power of Sale and the typical clauses inserted into an Agreement of Purchase and Sale. Know what is Important to the Bank: We will explain the key factors the bank will be looking for, the typical time frames of negotiating a transaction and costs involved with closing. Understanding the process can assist you in negotiating the best deal with less stress. Due to privacy issues Power Of Sale and Bank Foreclosures are private and priviledged information. To sign up for our monthly 'Power of Sale' list give us a call at 905-896-3333 Or sign up below and provide a contact number. We value your privacy.